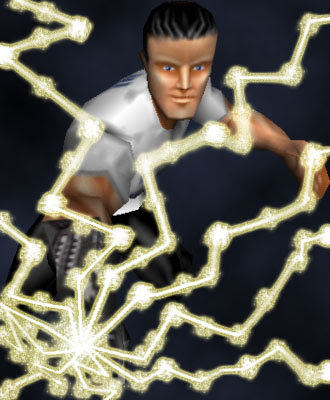 Johnny Domino gained his powers from piece of shrapnel that embedded itself in his head after his car was struck by a cable car that had been hit by a burst of energy known as a "jumpstart", while not unconditionally telepathic, could hear evil thoughts, could see in the dark and did not require sleep. His costume and equipment were merely makeshift items from hardware stores and the like, plus a kevlar vest his father lent him. 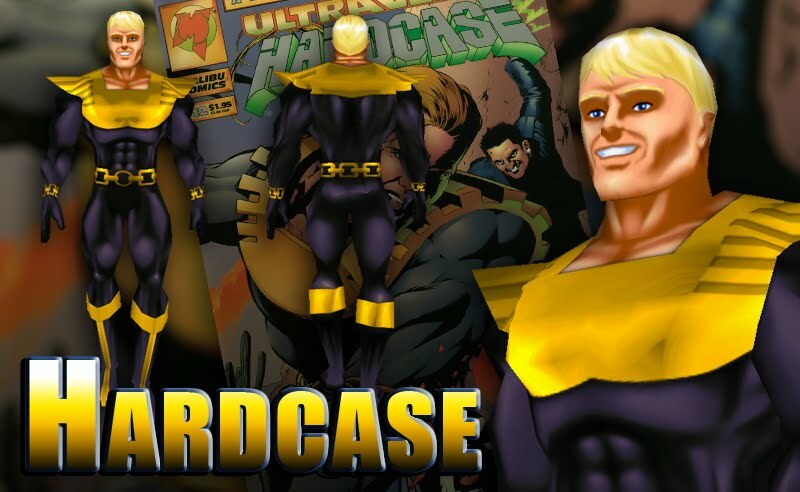 Incredibly strong, Hardcase is able to throw a car over 50 yards with little effort. His legs muscles allow him to leap nearly a mile. 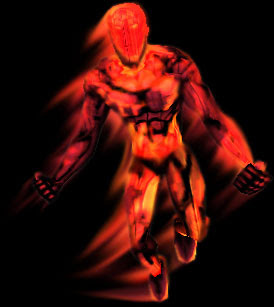 Nearly invulnerable to damage and changes in temperature, only extreme temperatures affect him. When he is hurt, Hardcase can heal quickly, though the process is sped up if he drinks seawater. His senses are enhanced, allowing him to hear and see over long distances. This is the last of my retrospectives on my time as a Freedom Force skinner. Don’t lose hope though, faithful reader. I’ve actually taken up skinning again to keep up my skills in Photoshop. You’ll be seeing more from me in the future. This is one of the last version of Ewzzy. By this time the character took a twist as an international man of mystery. I am so glad that I shopped together a cummerbund and bow tie in order to give it that tuxedo feel. 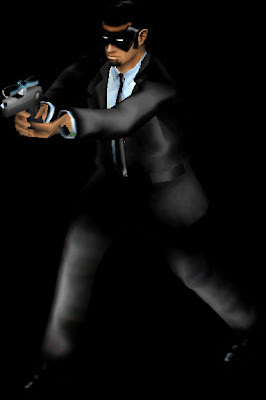 This version of me was pretty definitive as far as starting the transition from detective to secret agent. That line leads to our next two. This black-ops stealth Ewzzy has a real Sam Fisher vibe to him. Freedom Force as a game doesn’t allow for being too stealthy but as a character and skin this one was a big accomplishment to me. 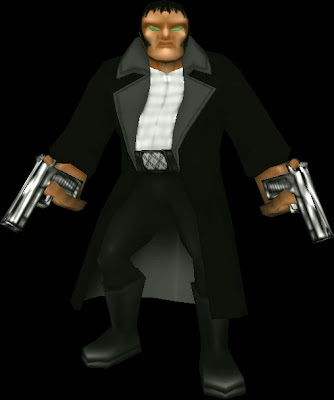 I can imagine this Ewzzy leading a team of agents into a villain’s lair and doing what other heroes are afraid of doing. This is it. You’ve met this version of me before, but not in such fidelity. 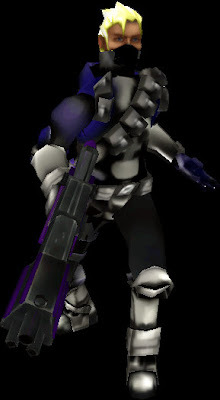 Between skins, I bulked up a lot and added lots of armor and a big gun. This is probably the most complicated skin I had ever done. Everything but the face and hands were drawn completely from scratch, something I hadn’t ever really tried. This is the Ewzzy that could go toe to toe with a real super villain and come out on top. Atom Bob was one of the fifty some people present on a cable car that was struck with a burst of energy from The Entity on The Moon, which imbued all of the passengers with superpowers. Bob Hardin was on the cable car with his friend who later came to use the Grenade. They both joined the group of ultras known as The Strangers. 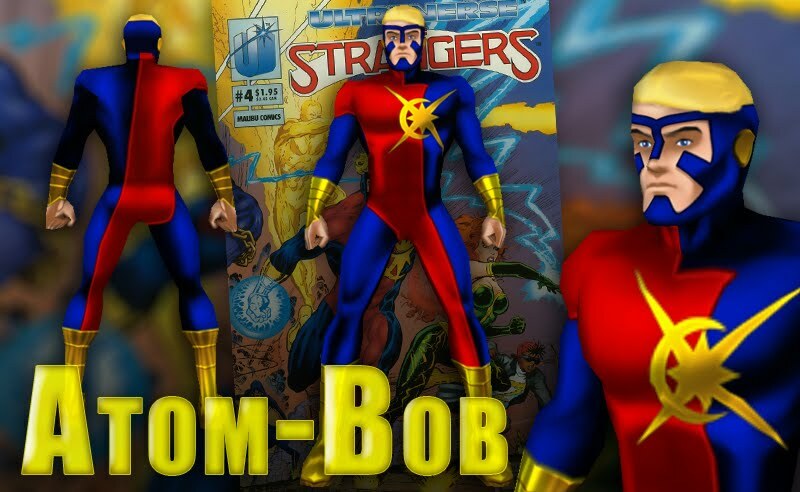 Atom Bob was arguably one of the most powerful members but his control over his power was tenuous at best which later drove him to become the villain known as Pilgrim. In this edition of my tour down memory lane we’re examining some of my more experimental designs for Ewzzy. I spent a long time trying to figure out my character, these are some of the failures. This was the golden age version of Ewzzy. The idea being that if I was a legacy hero from the 1940’s this is what I would have looked like. The big problem here was that the character wasn’t that different and my skin barely changed anything from the base. I look very mysterious though. That’s a good thing for a 1940’s psychic detective. If the last version of me was from the golden age then this would be me from the future with enough pouches that Rob Leifeld had to have drawn me. This was another one where the original skin was so close to what I wanted that not enough changes could be made. Also, the blonde hair looks so stupid on me. I’m just not a blonde. The problem with this skin was that I didn’t have a solid idea of what I wanted. 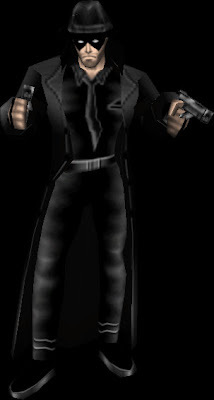 The Hitman mesh had just been released and it looked like it was perfect for my character, but at the same time, It just didn’t work. I was just trying to recreate my other look for a new mesh and it didn’t hold up well at all. I say part one, but I don’t know how long this series will go. I’ve got 7 skins ready to go so we’ll have at least a week of this. 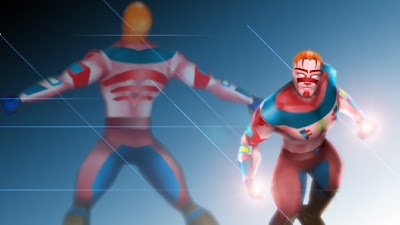 This the first of my new skins for Freedom Force. 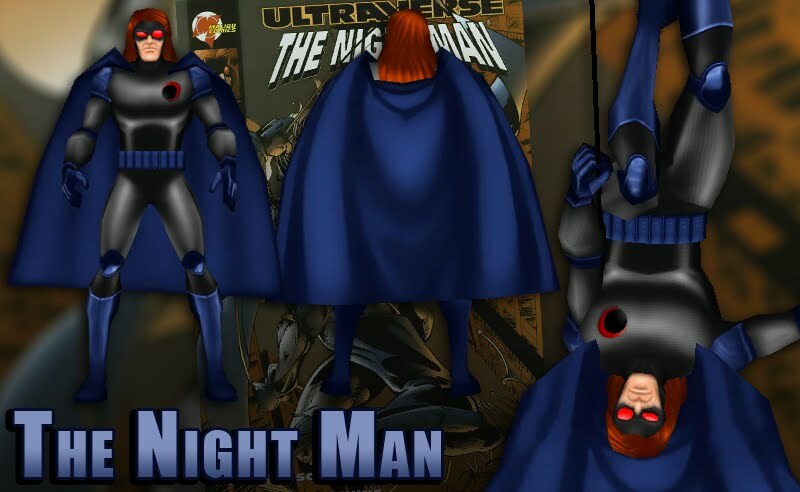 I’ve been making skins of heroes from the Ultraverse. 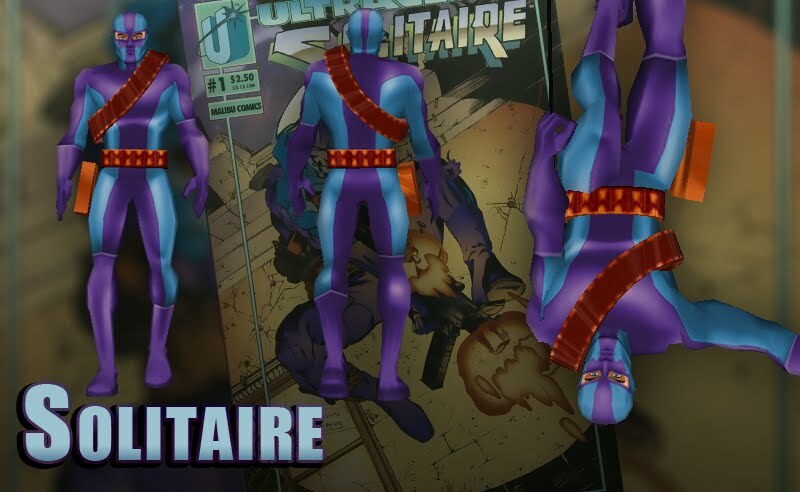 Solitaire's secret identity is Nicholas Lone, son of Antone Lone, L.A.'s major crime lord within the Ultraverse. This was, in fact, the main driving force of the plot of the series, as Solitaire's superpowers were given to him by his father after Nicholas tried to kill himself by driving a sportscar off a California cliff side. This suicidal desire was fueled by the realization that his life had become an empty shell due to the secrets he kept, knowing his father's true nature. 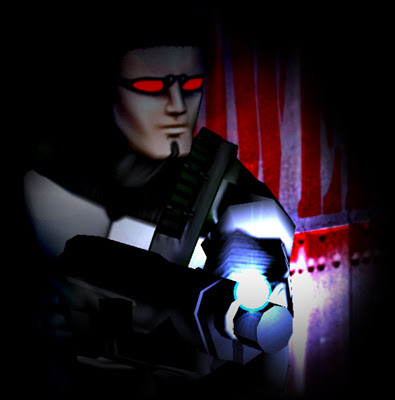 Anton Lone then had his son's body installed with nanomachines capable of rebuilding his body. Waking up and realizing he could not die, Nicholas Lone swore to use the wealth given to him by his father to end the atrocities his father caused. Yesterday was our last day with Jomay. 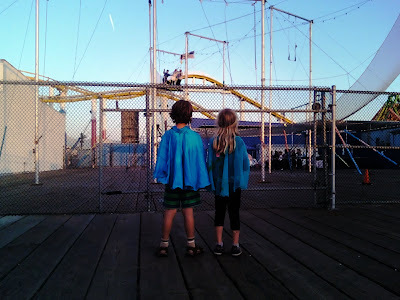 We went back to Santa Monica Pier to play in the arcade and watch some trapeze. So passes our time with Jomay. Come back anytime. You're always welcome here. We went to the Getty Center art museum today. I'm more into modern art but as you can see from my pictures, the place was absolutely amazing. This assignment was my most controversial. That isn’t saying much, because none of my other projects were controversial at all. The assignment was to do a set dedicated to Women’s History Month. Most people took pictures of women in their family or their girlfriends. I decided to do something a little more political and photograph action figures. The concept was that this would expose to people how, ostensibly strong, women are presented to young boys. Some people who didn’t understand the concept thought my work was inappropriate. By the way, yes, the toys were all mine, leftover from my childhood. They’ve since been sold in a yard sale. This was actually the first photoset I did for class. It was originally processed as B&W but I shot in color. The original color versions are much better. The assignment was to take pictures of a single object that would somehow transform the image. I used a toy of Megaman’s nemesis, Protoman, I wanted him to seem real. 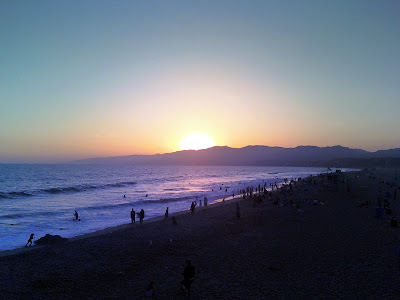 Too bad I had no idea how to use a camera yet, because I took 300+ pictures and these are the best ones. At least I didn’t take pictures of a broken glass and say it was “transformed.” I’m looking at you, rest of the class. 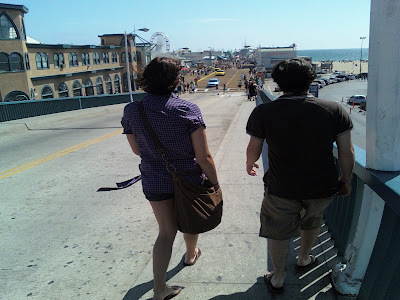 Jomay is in town so we went to Santa Monica Pier. 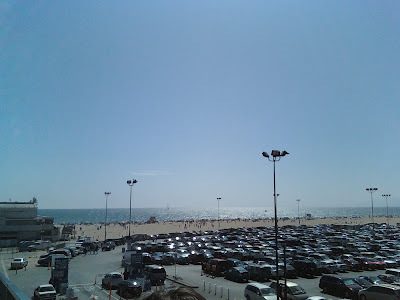 I finally saw the ocean! 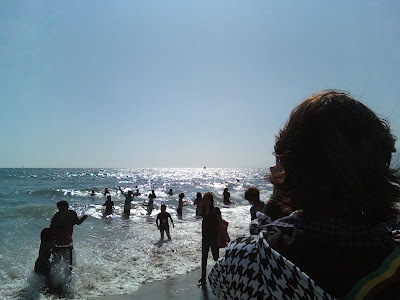 The beach was so freaking cool! 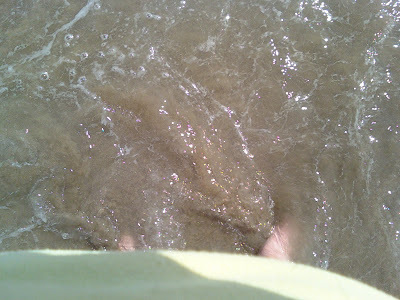 I stuck my feet in the water. 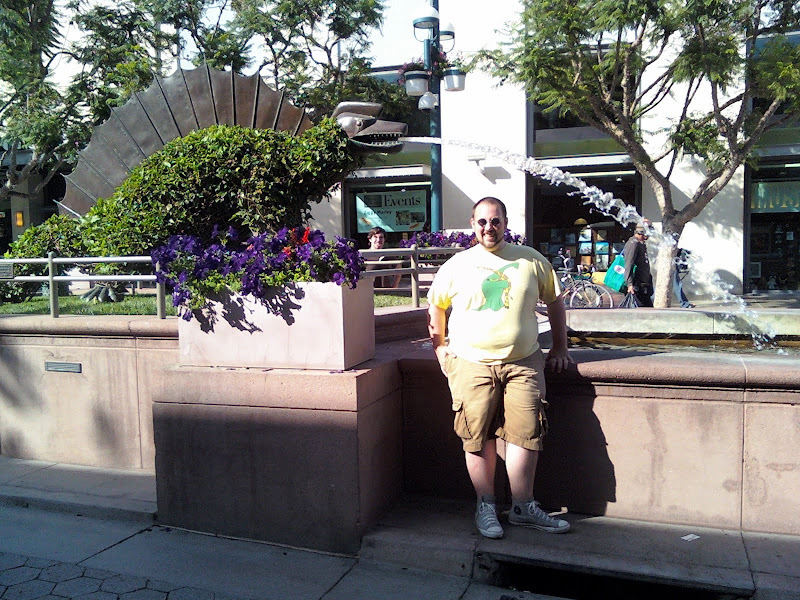 Then we went to the promenade. 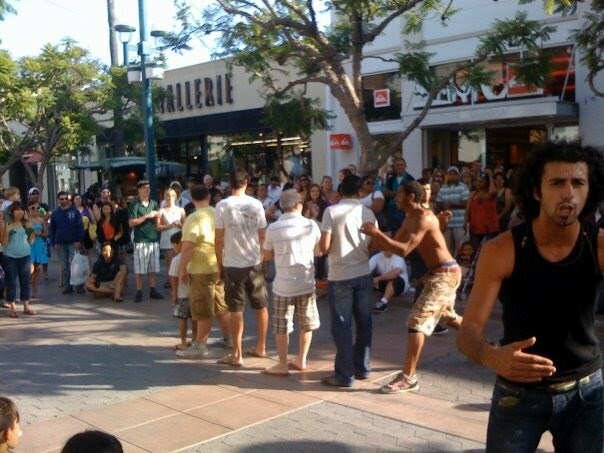 There were lots of street performers. 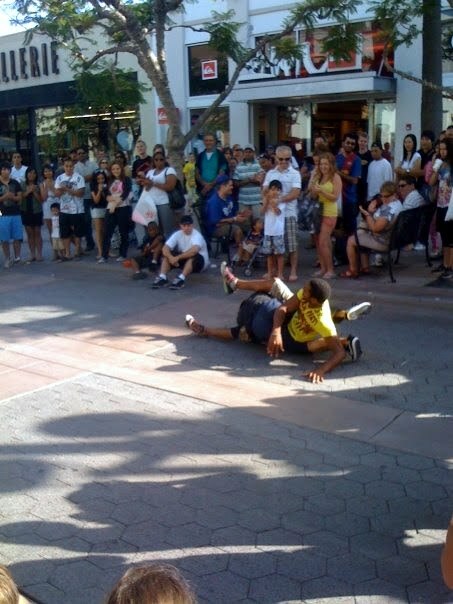 I even got pulled into a performance! I was scrolling through my old photos, performing upkeep on my collection. Alas some of my old JPG’s had become corrupted. 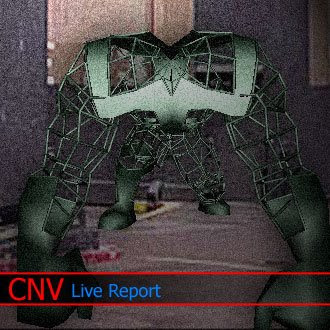 It only effected the largest right off the camera images and they are largely inconsequential but now they’ve been given a new life as error art. These pictures weren’t worth much when I took them, but they look pretty neat now that they’ve fallen apart. Bonus time here the Ewzzy blog. I only have one original character left and he’s obscured by my overly creative typefacing. That means you get three bonus copyright infringing skins! Tide is another character with a fairly common power. He could turn parts or the whole of his body into water. The difference between him and other aquatic characters was his size. 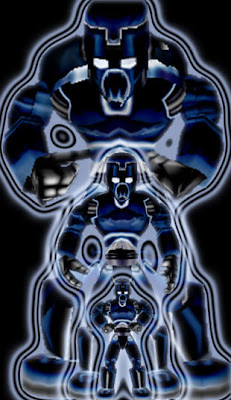 At the size of the Incredible Hulk he was a force to be reckoned with on the battlefield of Freedom Force. I recall giving him all the area attacks that I could so he would destroy all the buildings around whenever he attacked. I believe there was a power so that fire hydrants in the game would erupt in his presence. 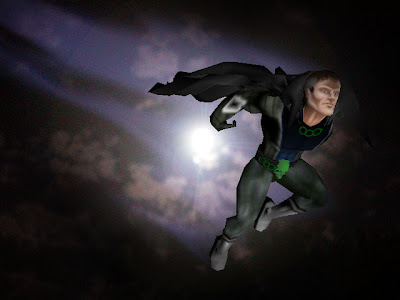 Hal Jordan. 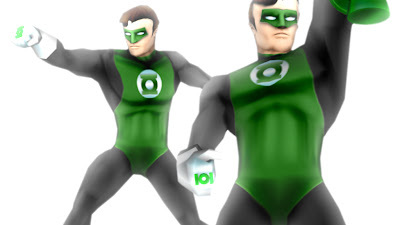 Green Lantern. 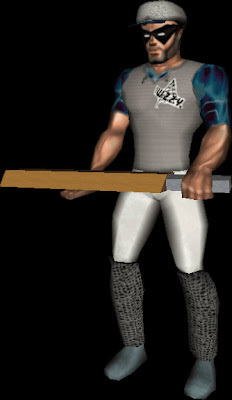 This is one of the few skins I made completely on my own with no base textures for the muscles and face. He was a real challenge and one of the last characters I ever skinned. 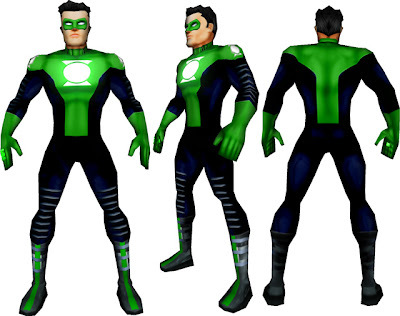 Kyle Rayner was always my favorite Green Lantern. 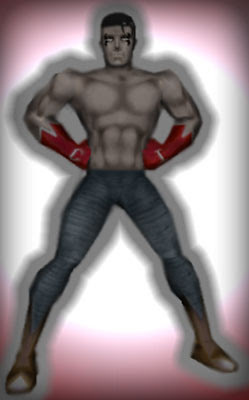 When he debuted this costume I re-installed Freedom Force just so I could skin him. Ron Marz’s writing of the character is what got me reading comics on a regular basis. When he left the series so did I. 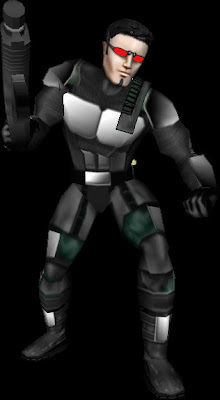 The very first skin I ever made for Freedom Force was actually of Guy Gardner Warrior. To finish off my career as a skinner I created this skin to see how far I had come. I wish I could find my original, because in three years I had grown in leaps and bounds. 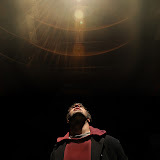 Though, I apparently still felt the need to toss some lens flares in for good measure. It’s time for another round of Freedom Force retro recap. Let’s dive right in. This is Lucas. I’m glad his lightning powers are covering up his secret shame. He’s based on Lucas Barton from the movie The Wizard and yes that is a Power Glove on his hand. I didn’t have to tell you that. I could have just claimed that was his name and moved on. That looks like any old magic glove in this shot. You can’t tell how I lovingly rendered each detail of the Power Glove. You would never have known! This was the healer of the group. His name is Patron. 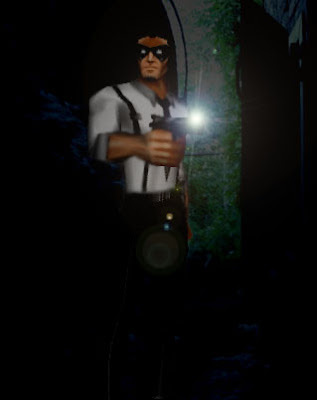 He looks sad because I used more lens flares. He is so sorry for me. 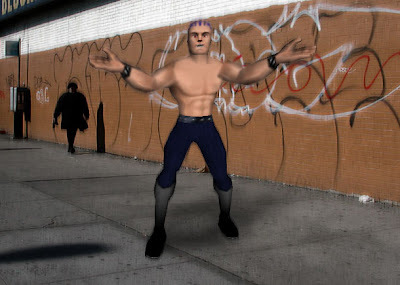 I really just changed the colors of the default skin for this character model and then fixed up his face. I removed a mustache. Maybe that is why he looks so sad. This is Shell. He had the power to change his size from normal to small or gargantuan. He’s a fourteen year old super genius. In the large size he was stronger but slower. Obviously. In the small form he was much faster and could scale walls and jump high, but he wasn’t very strong. The ability to switch out character meshes mid battle came along late into Freedom Forces lifespan with a fantastic mod. Creating characters and making them work within the game mechanics like this was such a fun creative exercise. Don’t mock me when I tell you that this is named Teppes. 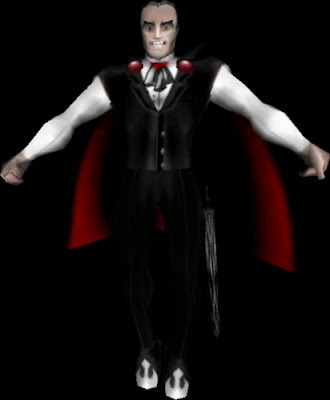 Yes, for all intents and purposes I drew Dracula, and gave him a sword. I’m pretty sure new energy draining powers were just added to the game and I created this knock-off just to test them out. I have another lineup of characters from my days as a skinner for the game Freedom Force. 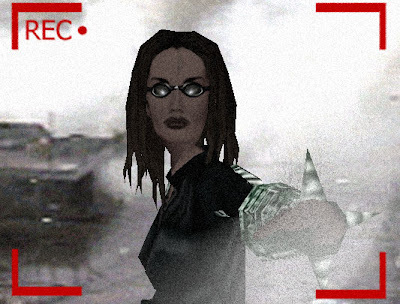 I found all of these images when I opened my Geocities account for the first time in five years and lo-and behold these were still there. Lets have another look shall we? This wonder of my early creative mind is known as Impervious. 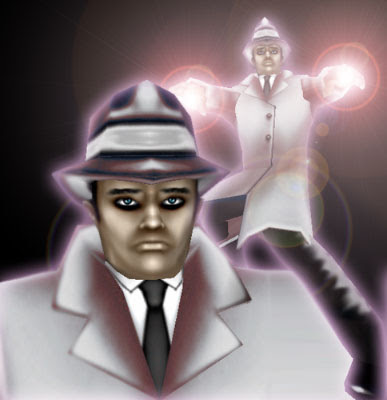 I know for a fact that his impenetrable aura did appear in game and that his only power was invulnerability. Based on his ill-drawn jeans, cowboy boots and gloves I’ll bet he used to be in a Rodeo. Lets make up an origin story. Shall we? Eugene Coffey was born special, but he didn’t know it. Working rodeo shows since he was just a kid he never showed any fear. That is, until one day he faced off against a bull bigger than any other he had ever known. Showing fear for the first time in his life, he cowered before the bull, on instinct a glowing shield popped up and saved him from certain doom. The bull however died in the incident. Fleeing from the confused and angry crowd Eugene took the name IMPERVIOUS and struck out on his own. That was fun. The next one on our list is… Jessi. I’m pretty sure this one is based on my girlfriend at the time. I made characters for all of my friends, but this is the only one to survive. Just like I don’t look much like the FF version of Ewzzy I don’t recall her looking a lot like this. I also don’t remember her ever doing Tai Chi on the beach. I clearly spent a long time on this one, because female skins were a billion times harder to make than guys. The chest geometry stretched out any texture you made. I’m proud of this one. La Prisa had a pretty cool back story. 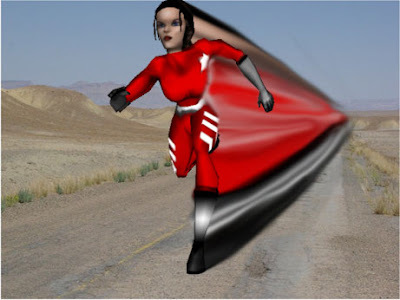 The name is Spanish for “The Rush” and as you can tell she has super speed powers. I distinctly remember her story was that she was very religious and that she believed that her powers were given to her by god. Nothing could convince her otherwise. I wish I had more of a back story for this one. I think she was supposed to be a love interest for Ewzzy but I could be way off. The only detail I have is that her filename was lora.jpg so we’ll call her Lora. I bet she thinks she’s sneaky hiding in the shade of the otherwise well lit downtown. If you read this blog you'll note my love of Photoshop. There are few problems that it can't solve. What you likely don't know is how the love story began. 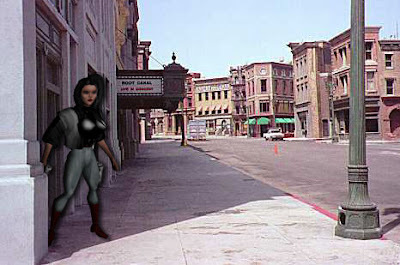 In 2002 Irrational Games released Freedom Force for the PC. 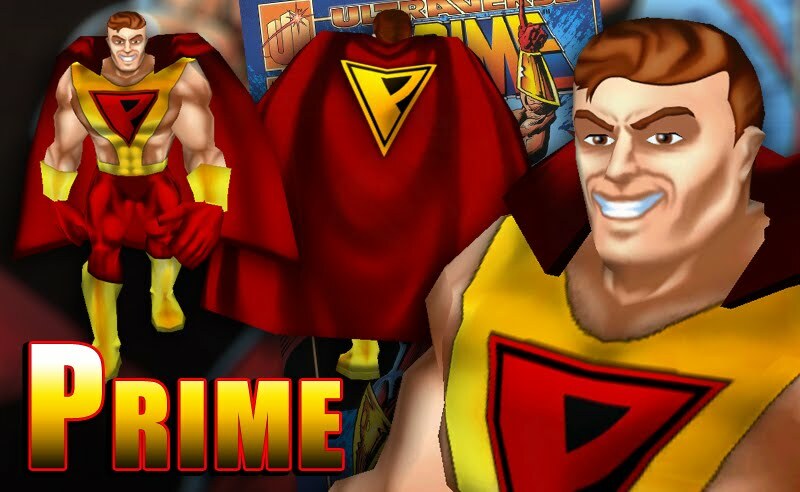 The game allowed for skinning of the character models to create your own heroes. 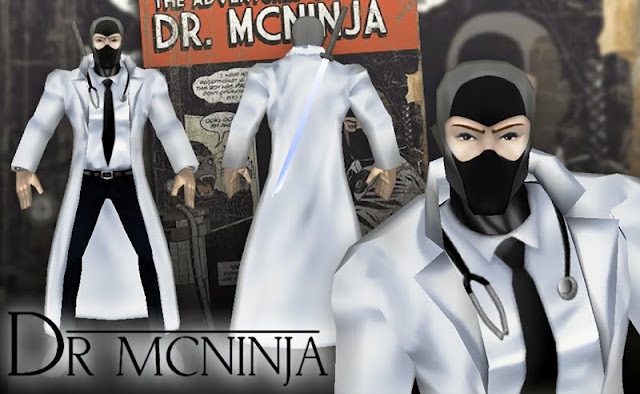 The immediate use of this was to put Batman and Spider-Man in the game. I used my school's copy of Photoshop to join in on the fun. 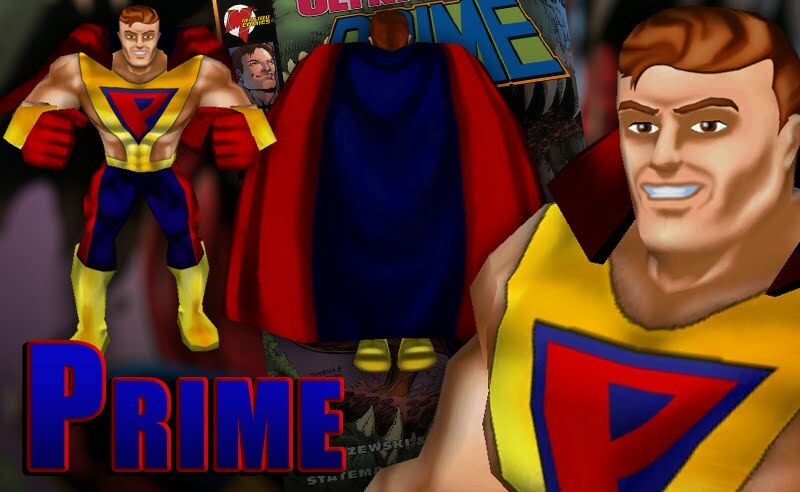 So I'm going to spend the next week or so walking you through my work as skinner for Freedom Force. 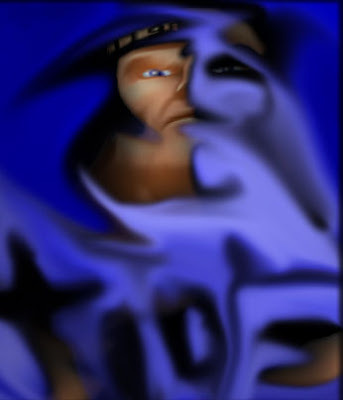 These are some of my earliest works in Photoshop and will likely shame me for how bad they were. That guy to the left is supposed to be me. 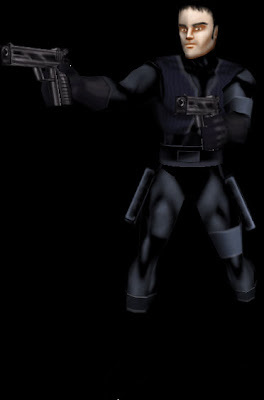 Everybody made avatars of themselves for the game and I was a black-ops guy with the ability to see just one second into the future. Just long enough to dodge a bullet. 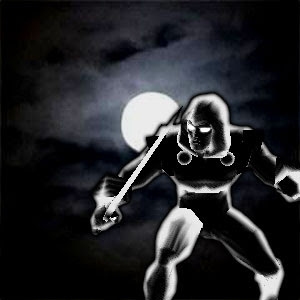 At night in dreams the power was stronger and would allow him to see into more far flung futures. You can tell I spent a lot of time figuring out this guy. I went through about 13 different iterations before this one. The others were mostly gangsters in zoot suits.